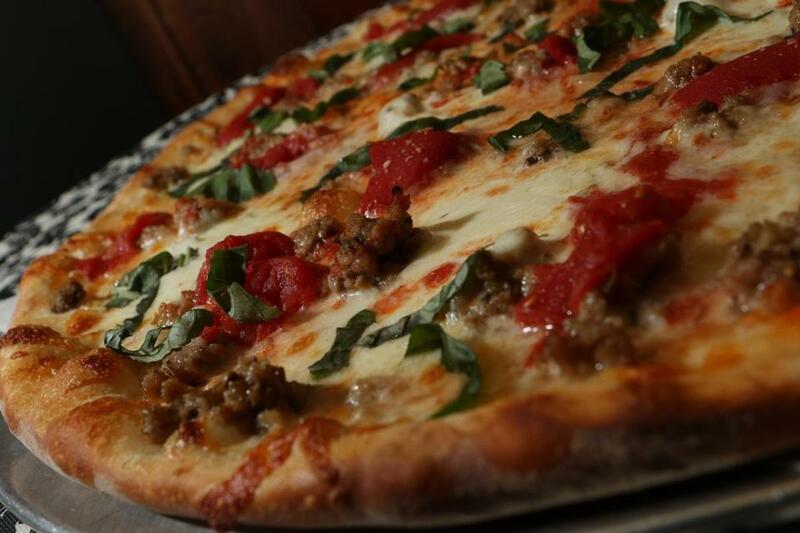 The Sienna pizza is topped with crumbled, house-made pork sausage woven with fennel, coriander, and paprika. IN THE KITCHEN Todd Harrington and his wife, Kathleen, opened Anzio’s in North Grafton in 2012. “I’m originally from Connecticut. New Haven pizza is different than up here, and I wanted to introduce people to the style of pizza I grew up with,” Harrington said. He initially cooked while Kathleen ran the front of house; eight months ago, they hired a chef, John Saccomando, to helm the kitchen. “It was his idea to make our mozzarella in-house,” Harrington said. THE LOCALE Anzio’s sits on Route 30, just down the road from Tufts University’s Grafton campus, and shares a building with Pecorino, a wine and cheese shop. The intimate dining space, which seats 49 and hosts occasional wine and beer dinners, has burnt-orange walls, a mural painted by a staff member, and lights strung around the room. “We wanted it to have a Tuscan flair,” Harrington said. “You kind of feel like you’re in Tuscany. As soon as you walk into the door, you get the aroma” of the brick oven. ON THE MENU That brick oven is not only the restaurant’s signature, but its pride and joy: At 700 degrees, it can cook a pizza in three minutes flat that’s “crispy, airy, and light. You can eat this pizza and not feel bloated,” said Harrington, who points first-time visitors to the restaurant’s original pie (18-inch large $14; 12-inch small $11), which keeps it simple with house-made tomato sauce, parmesan cheese, and whole-milk and buffalo mozzarella. The bubbly crust arrives exactly as advertised, the brick oven providing a light, smoky char. The base of the pizza seemed a little flimsy when loaded with toppings, but what fresh and creative toppings they are. One of the most popular specialty pies, the Sienna (large $18; small $13), is showered with crumbled, house-made pork sausage woven with fennel, coriander, and paprika. Juicy plum tomatoes, a smattering of basil (it would benefit from more), a drizzle of garlic oil, and mozzarella complete the satisfying array. The spinaci pollo pizza (large $18; small $13) starts with a thin layer of garlic-cream sauce and is topped with grilled white-meat chicken, fresh spinach, and a blend of ricotta and mozzarella cheeses. The best part, perhaps, is large cloves of garlic roasted to unlock its inherent sweetness. The buffalo chicken pizza (large $18; small $13) combines grilled chicken with peppery arugula, caramelized onions, and mozzarella and blue cheeses, the whole pie doused in hot sauce for a suitably spicy punch. But there’s more at Anzio’s than items from the brick oven. “We opened with pizzas, salads, and panini. That was supposed to be it. After a year, people asked if we could do pasta, too. It kind of morphed into a restaurant at that point,” Harrington said. Now there’s Bolognese ($16), wide pappardelle pasta grounded in a beef, pork, and veal sauce with tomatoes and red wine. Chicken marsala ($16) tosses a tender scallopine with sweet wine and asparagus, mushrooms, and fettuccini. For vegetarians, chestnut ravioli ($15) with caramelized Brussels sprouts in a brown-butter cream sauce, and roasted vegetable manicotti ($14) stuffed with roasted peppers, eggplant, garlic, onions, and spinach are fine options. On the lighter side, the restaurant makes its own arancini ($8) using carnaroli, a rice grown in northern Italy, flecked with roasted garlic, mushrooms, spinach, and cheese. They’re mild and not fried as crisp as some versions of the dish; the accompanying tangy marinara sauce and sprinkle of parmesan are a welcome, flavorful touch. Panini ($8 to $9) include chicken parmesan, honey-mustard chicken, and steak and cheese. Conversely, for those with large appetites or a crowd to feed, the restaurant provides bulk catering services. Anzio’s Brick Oven Pizza is at 135 Westborough Road (Route 30) in North Grafton; 508-839-4900, www.anziosbrickovenpizza.com.